There are four rapid transit lines for public transport in Bangkok: the 2 BTS (skytrain) lines, 1 MRT (subway) line, and 1 airport rail link. 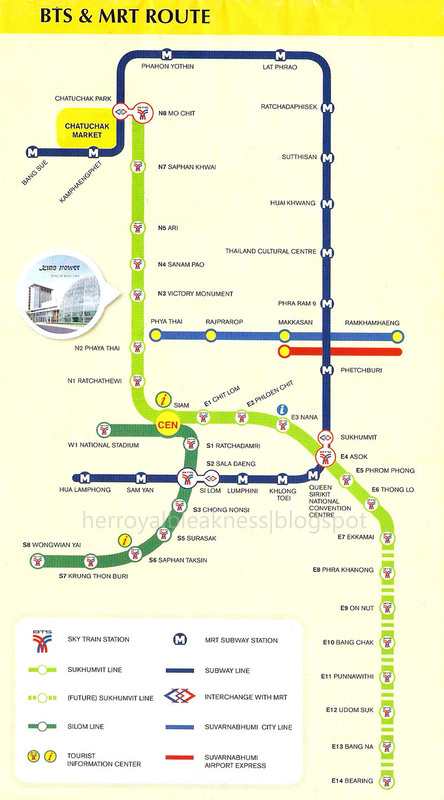 The Suvarnabhumi Airport Rail Link is comprised of the Express Line and the City/Commuter Line. I'm using a scanned map I got from the airport and tweaked the Express line (red) by extending it way up to Phya Thai station (the original map had the red line up to Makkasan). Bangkok's BTS is composed of two major railways: its West-to-South Silom Line (light green), and the North-to-East Sukhumvit Line (green). Silom line runs from Mo Chit to On Nut, while the Sukhumvit line runs from National Stadium to Wongwian Yai. The BTS's two major railways intersect via the Siam station, hence, Siam is both present in the Silom and Sukhumvit lines. I therefore conclude that Silom and Sukhumvit are Bangkok's very own transportation Siamese twins! The BTS fare is approx 5 Baht per train stop. Note that there are information centers present in two BTS stations, one in Siam (Silom line), another in Saphan Taksin. These are airconditioned offices that aid tourists with their sightseeing queries, dinner cruise bookings and anything else they can be of assistance to. Information centers close at 8:00PM. Unfortunately, we weren't able to use or even see the subway during our trip. All I can tell is that it has the most number of stations among the other railway transports and that it operates from 6:00AM till midnight. So there you go folks, Bangkok's Train System in a nutshell. The Airport Rail Link, the skytrain (BTS) and the Mass Rapid Transit. If you see any incorrect entry, please feel free to jot it down the comment form. wow you've been to Bangkok! how was it? dami ba shopping?? mura daw dun sobra! the trip was a blast! :) i enjoyed myself too much i think. hehe. and yeah, shopping haven nga sya, fashion-wise, kasi napaka affordable. Work With Rajo and the Team!